Posted: Tue Jun 02, 2009 7:49 am Post subject: What is it? 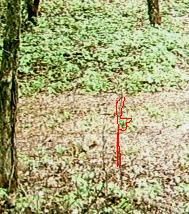 These are poor quality trail camera pictures from southern Indiana. The first shows a squirrel for size reference. the second? Posted: Tue Jun 02, 2009 10:59 am Post subject: Re: What is it? Posted: Tue Jun 02, 2009 11:16 am Post subject: Re: What is it? Posted: Tue Jun 02, 2009 11:20 am Post subject: Re: What is it? 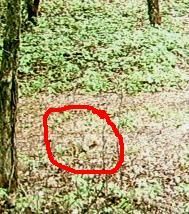 When I zoom way in it looks like a house cat to me. Holding front left leg up, head looking almost straight down. Posted: Tue Jun 02, 2009 11:21 am Post subject: Re: What is it? Posted: Tue Jun 02, 2009 11:25 am Post subject: Re: What is it? If you were really hungry, I bet you'd find a squirrel in those leaves! Posted: Tue Jun 02, 2009 11:45 am Post subject: Re: What is it? Posted: Tue Jun 02, 2009 11:49 am Post subject: Re: What is it? Posted: Tue Jun 02, 2009 11:53 am Post subject: Re: What is it? Posted: Tue Jun 02, 2009 12:05 pm Post subject: Re: What is it? I thought it was a cat too. With a leaf on the 'tree" in the fore ground blocking out part of it. The leaf is brighter in the squirrel picture. Posted: Tue Jun 02, 2009 12:07 pm Post subject: Re: What is it? 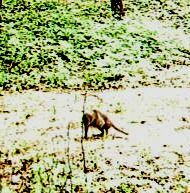 I saw it as the left fore arm down and right side picked up - looking away from the camera cleaning its arm pit. Posted: Tue Jun 02, 2009 12:18 pm Post subject: Re: What is it? Sometimes a bird will fly past triggering the camera, but it doesnt actually take the picture until the bird is out of the frame. I'm not sure there is anything really there to look at, maybe a trick of shadow. Posted: Tue Jun 02, 2009 12:24 pm Post subject: Re: What is it? Posted: Tue Jun 02, 2009 1:38 pm Post subject: Re: What is it? Edit: Guess I should read the whole thread before posting next time. Posted: Tue Jun 02, 2009 1:44 pm Post subject: Re: What is it? I'm gonna say a cat licking its paw.